It’s a little-known secret that patients can get thousands of dollars directly from a drugmaker. Kip Burgess was relieved last year when pharmaceutical giant Amgen overnighted him a $2,976 check to help pay for his go-to arthritis drug, Enbrel. The 36-year-old psychologist had run into an increasingly common problem: The copay coupon sent by Amgen couldn’t cover the drug’s more than $4,000 monthly price. Panicked, Burgess had called Amgen and pleaded for help. The drugmaker sent him the check after he provided a credit card statement and an explanation of benefits to prove he bought its drug. It’s one of the little-known secrets in health care: When financial incentives like copay coupons and debit cards won’t work, pharmaceutical companies sometimes will write a check — what they call direct reimbursement — to make sure a loyal patient will stay on a high-cost, brand-name drug. Drugmakers began using now-popular copay coupons and other forms of assistance more than a decade ago to help patients pay out-of-pocket costs for medicines, particularly high-cost specialty drugs such as those that treat autoimmune disorders. The coupons have a dual purpose: They mask the true costs of a drug for patients and give patients a financial incentive to stay on an expensive drug until their insurance deductible is met. “This highlights just how dysfunctional the system is, and it just isn’t working for patients,” Albritton said. The practice of sending checks is legal as long as the patients are not enrolled in government-funded insurance such as Medicare and Medicaid, said William Schiffbauer, a Washington, D.C.-based health insurance attorney. “You can accept cash from anybody as long as it’s not a government program,” Schiffbauer said, noting there may be income tax obligations for the patient. The federal anti-kickback and Stark laws were meant to prevent bribery of patients and doctors and do not apply to private commercial insurance plans. AbbVie, which makes the blockbuster arthritis drug Humira, will send a check if patients can prove their copay card doesn’t work for a variety of reasons, said Adelle Infante, director of external communications for the company. 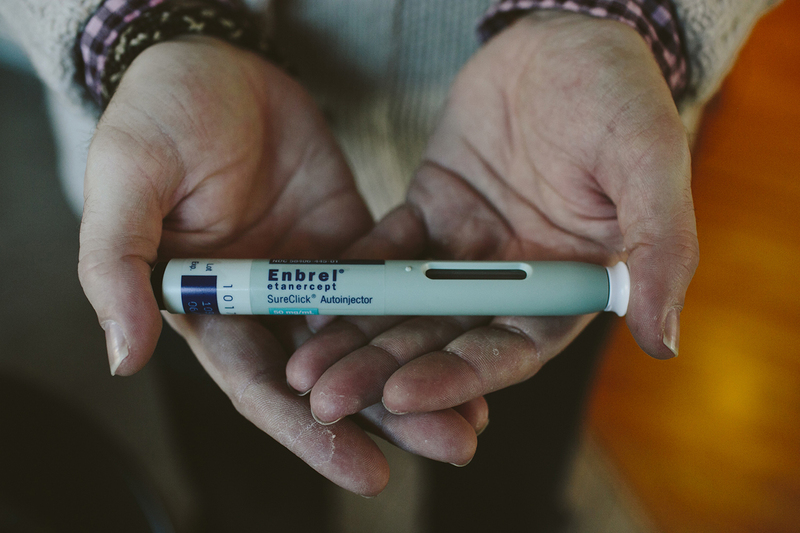 Amgen, the maker of Burgess’ arthritis medicine, provides up to $12,000 of copay assistance each year to commercially insured Enbrel patients who need help meeting out-of-pocket expenses, often regardless of the patient’s financial status. When the cards fail to work, for whatever reason, Amgen can send direct reimbursement. While Amgen’s primary assistance is through copay cards, “in some instances, based on patient preference, Amgen will provide direct reimbursement” after a patient has already paid for the medicine, Amgen’s Kristen Neese, director of corporate affairs, said in an emailed statement. Harry Totonis, chief executive of ConnectiveRx, a pharmaceutical services company, said sending checks to patients is “not a commonly used practice” and happens “a fraction of 1 percent” of the time. He declined to confirm the average value of the checks or name the drugmakers that issue checks via ConnectiveRx. “All of these programs try to help patients afford the medications,” said Totonis, whose company bought PSKW, which issued the check Burgess received from Amgen in 2017. Daniel Nam, executive director of federal programs for AHIP, the America’s Health Insurance Plans, said direct reimbursement using checks is just another way for manufacturers to make insurance companies pay for expensive drugs, which helps jack up monthly premiums. This approach will “create a new black hole of patient-directed payments and avoid any scrutiny,” he said. Insurers and lawmakers have begun to push back against the popular copay programs, saying they raise the cost of medications in the long run. California passed a law last year limiting their use and federal litigators have increased scrutiny. Insurers and pharmacy benefit managers like CVS Caremark and ExpressScripts have begun refusing to use copay cards as the drugmakers intended. CVS Caremark introduced “copay accumulator” programs two years ago. Patients can use a copay card or coupon to help cover the cost of the drug, but the payment does not count toward their insurance plan’s deductible or out-of-pocket maximum. That often means that when the assistance from the drugmaker — which is generally limited to a fixed dollar amount — runs out, the patient is on the hook for a much larger share of the cost of the drug. “It is important to remember that while manufacturer-sponsored programs, such as copay cards, can help reduce out-of-pocket costs for patients in the short-term, they can also lead to increased health care costs in the system by encouraging the use of higher cost, often branded drugs,” Christine Cramer, senior director of CVS Health’s corporate communications, emailed this month. A copay accumulator likely triggered Burgess’ panicked call in 2017. Amgen had issued Burgess a copay card preloaded with $12,000 to help cover his out-of-pocket expenses. But his pharmacy began charging the full monthly cost for Enbrel, not merely his out-of-pocket share, against his copay card. And that big charge didn’t count against his annual deductible. So, after a couple of months, Burgess suddenly needed to pay thousands of dollars to meet his deductible and get the medication that helped him get out of bed in the morning. But Amgen is reformulating the remedy Burgess sought, and he and other patients may be out of luck. As of 2018, Amgen said, it will send checks only to financially needy patients whose insurers and pharmacy benefit managers use accumulator programs. The patients must show incomes at 500 percent or below the federal poverty level, or $60,700 for an individual and $125,500 for a family of four. An Amgen email stated that only “an extremely small number of patients” have received money that way. Burgess doesn’t qualify. He had to raid his savings this year for the money to cover his deductible. This highlights just how dysfunctional the system is, and it just isn’t working for patients.